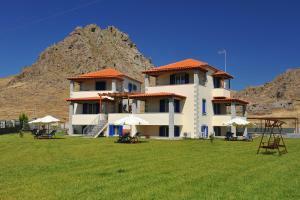 A-HOTEL.com - Luxury and cheap accommodation in Lerá, Greece. Prices and hotel, apartment booking in Lerá and surrounding. Set in Portianón, Kleanthis Stone House offers a garden. All rooms feature a kitchen and a private bathroom. Tradition and Comfort in a Unique Windmill is located in Kondiás. This property offers access to free WiFi. Offering a sun terrace and hot tub, LimnosWindmills is located in Kondiás in Limnos. Gallery of Contemporary Art is 1. Featuring a terrace, Stone Houses is a housing complex located in Kontias in the island of Limnos. Each house has a terrace overlooking the mountains. Set 3.7 km from Folklore Museum and providing free WiFi, Kontias Stone Residences features accommodation in Kondiás. Evgatis Beach Stone Villas is located in Thános and offers a garden and a terrace. Guests staying at this villa have access to free WiFi and a fully equipped kitchen.